THE MODERN WEST owes much to ancient Greece and Rome, including the building blocks of constitutional law and the traditional categories of academic disciplines. Even our scientific terms derive from Greek or Latin. The pagan Greco-Roman world did not give modern Western civilization hospitals, however. These institutions first appeared in the fourth century A.D., organized by Christian churches in the Greek (eastern) half of the Roman Empire. Ancient Greece had centers to cure the sick—the temples of Asklepios (spelled “Asclepios” by the Latins), the god of medicine—where the seriously ill came for miraculous divine healing. Rome organized infirmaries for legionary soldiers. Christians, however, were the first to open public hospitals—institutions designed to offer room, board, and therapeutic care, based on scientific medicine, to anyone who needed such assistance. These hospitals evolved from earlier Christian welfare institutions known in Greek as xenodocheia or xenones (hospices or hostels). In 312 the emperor Constantine converted to Christianity, and that faith began its climb to dominance in the Roman Empire. Bishops assumed civic leadership roles, often while remaining true to Christ’s command (Matthew 25) to feed the hungry, shelter the homeless, and visit the sick. While the fourth-century church grew, population surged in rural areas of the eastern Roman Empire. And as families in the countryside grew larger, younger children migrated from villages to cities in search of jobs. Their immune systems were not prepared to resist the new diseases that they encountered in urban areas. Among the worst of these was leprosy, which also increased during the fourth century. The need was great: with Christianity’s new prominence, people were increasingly seeking help from the churches. And the bishops responded, establishing xenodocheia as a new type of welfare institution capable of providing material assistance to far more people than ever before. Christian xenodocheia began as poorhouses where homeless men and women could find clean beds, nourishing meals, and new clothes. These poor houses also supported local residents who had homes but were unable to feed their families. As these instruments of public charity grew to serve more and more needy people, fourth-century bishops found that their expensive services could not be financed solely through donations from the faithful at Sunday services. Thus they pleaded with wealthy Christians to donate estates as endowments for the xenodocheia. Some even managed to convince emperors to assign tax revenues to cover expenses. With growth in Christian social services came specialization. During the 350s the Christian monastic leader Eustathios from Sebasteia and his communities of urban monks developed a new type of xenodocheion that served that most socially visible class of the sick: the lepers. Eustathios founded a leprosarium outside Sebasteia in 355, providing care for these sufferers for whom medicine offered no cure but who nonetheless needed food, shelter, and baths for their oozing sores. Meanwhile, xenodocheia began to specialize in serving other categories of needy people. Alongside those that offered long-term care for lepers, others arose with a special mission to shelter poor homeless people. A third type of xenodocheion concentrated on curing treatable diseases. The transformation from poorhouse to hospital was underway. Around 390, John Chrysostom, the ­virtuoso preacher who was then serving as priest at Antioch (Syria), described two separate charitable facilities maintained by Antioch’s Christians. One was a leprosarium for lepers and people with incurable cancer. The other he called a xenon (synonym for xenodocheion). Here one could see patients with “every cause of illness, strange forms of disease and many different types of suffering.” Chrysostom did not mention physicians, but later, as bishop of Constantinople, he built two institutions which he called nosokomeia (places for the sick). Over these he appointed clergymen as supervisors, and he staffed them with physicians and urban monks who worked as nursing attendants. Even the cooks he hired for these houses of healing served a medical purpose: in Greek medicine, diet was considered a vital part of curing illness. If you hear a note of rebuke in these words, you catch a common theme in Chrysostom’s preaching: frustration at wealthy congregants who did nothing while the poor suffered. A few years after Chrysostom opened these hospitals, Neilos of Ancyra in Asia Minor wrote a letter using a hospital as a metaphor for the world and its spiritually sick inhabitants. Like a hospital physician, Christ examines each patient to determine the right medicines and diet to restore spiritual health: “Many are the sick people in the hospital of this present age. The same medicine does not fit them all, nor is the same diet right for all. The physician (Christ) assigns the medicines and diet appropriate for each patient.” By the end of the fourth century, everyone knew what a Christian hospital was. After 400 the Roman Empire split in two. The Greek half survived as the Byzantine Empire, but the Western half, where Latin predominated, was overrun by Germanic tribes. In the Byzantine Empire, hospitals continued to develop. From the seventh century we have a fascinating description of a sophisticated hospital, the Christodotes Xenon, in the Byzantine capital of Constantinople. According to this account, an official working under the bishop of Constantinople governed the financial and legal side of the hospital, but two chief physicians supervised patient care, alternating every other month in overseeing medical procedures. Every day the chief physician on duty visited each patient to monitor treatment—just as Christ had made his rounds in Neilos’s metaphor. Under these chief physicians were trained medical assistants who carried out basic procedures such as minor surgery. Below them came servants who cleaned the beds and kept the lanterns lit at night. Despite repeated Muslim attacks after 638, the Byzantine Empire continued to support hospitals until its collapse in 1453. The emperors themselves financed some of the biggest hospitals, located in Constantinople. In the Western, Latin half of the Empire—Rome and Italy, Gaul (France), Britain, and the Rhineland—it took much longer for medical hospitals to emerge. The first Western Christian charitable institutions were founded in Rome, not by the Roman bishop but by an immensely wealthy Christian widow named ­Fabiola. Jerome (he of the Latin Vulgate) said: Fabiola [was] the praise of the Christians, the marvel of the gentiles, the sorrow of the poor, and the consolation of the monks. Whatever point in her character I choose to treat of first, pales into insignificance compared with those which follow after. Shall I praise her fasts? Her alms are greater still. Shall I commend her lowliness? The glow of her faith is yet brighter. Shall I mention her studied plainness in dress, her voluntary choice of plebeian costume and the garb of a slave? . . . To change one’s disposition is a greater achievement than to change one’s dress. It is harder for us to part with arrogance than with gold and gems. She was the first person to found a hospital, into which she might gather sufferers out of the streets, and where she might nurse the unfortunate victims of sickness and want. Need I now recount the various ailments of human beings? Need I speak of noses slit, eyes put out, feet half burnt, hands covered with sores? Or of limbs dropsical and atrophied? Or of diseased flesh alive with worms? Often did she carry on her own shoulders persons infected with jaundice or with filth. Often too did she wash away the matter discharged from wounds which others, even though men, could not bear to look at. She gave food to her patients with her own hand, and moistened the scarce breathing lips of the dying with sips of liquid. Jerome compared her to those who practiced a more distant benevolence: I know of many wealthy and devout persons who, unable to overcome their natural repugnance to such sights, perform this work of mercy by the agency of others, giving money instead of personal aid. I do not blame them and am far from construing their weakness of resolution into a want of faith. While however I pardon such squeamishness, I extol to the skies the enthusiastic zeal of a mind that is above it. A great faith makes little of such trifles. Monasticism had not yet arrived in Rome from the eastern provinces, so we cannot yet describe Fabiola as a nun. She worked in the tradition of the early Christian widows and deaconesses. Shortly after Fabiola’s death (400? ), Germanic tribes overran the Western provinces, cutting short any widespread movement to imitate Fabiola’s philanthropic institutions. From the sixth and seventh centuries, however, comes evidence that bishops in Gaul did establish welfare institutions in their cities. Were they inspired by Jerome’s descriptions of Fabiola? Most of these houses of charity were leprosaria and xenodocheia for the poor. At least one was a hospital. Bishop Praeiectus of Clermont built a xenodocheion for his city sometime before 676, staffing it with physicians. Benedict also took special measures to care for sick monks. He assigned them brother monks who waited on them and comforted them in their illnesses. But nowhere did his Rule mention medical care for sick guests. As a result, the Benedictine monasteries that spread from Italy throughout Western Europe never maintained hospitals, in the sense of institutions primarily dedicated to medical care. Their xenodocheia (called hospices in Latin) always remained simple guest houses, though many did provide basic nursing care for the sick when the need arose. From 850 to 1000 as Vikings, Huns, and Muslim raiders hammered Europe from every direction, Benedictine abbeys copied medical manuscripts, maintained herb gardens, and experimented with elixirs to cure diseases (the origins of many modern liquors). They kept alive ancient medical science, but they did not support hospitals. In 1157, the Cistercians (a reform movement of Benedictines) forbade monk physicians to treat laymen. 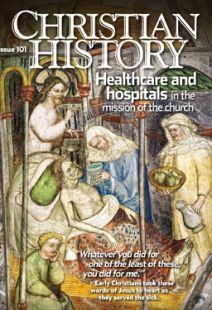 Thus, the rebirth of hospitals in Western Europe had to wait for the intersection of two distinct Christian movements: a new form of monasticism and the Crusades. This new form of monastic life began in the ­eleventh-century towns of Europe. During 500–1000 A.D., populations fell, cities shrank, and trade almost ceased. But at the start of the second Christian millennium, Genoa and Venice began to win victories against Muslim naval forces in the Mediterranean. Christian traders prospered, and towns expanded. With growth, however, came the same demographic problems that had faced the fourth-century East: more and more rural folk were moving into the big city—and catching big-city diseases. Benedictine monasticism had no solution for this problem of urban illness. First, they were rooted in rural areas. Second, their focus tended to be inward rather than outward to the larger society. And third, some Benedictine houses had declined from the original hospitable ideals of Benedict. But what they couldn’t do, a new sort of ascetic community could. Often founded by a new breed of monks called Augustinian canons, these communities organized them­selves to help people outside the cloister. Some Benedictine abbots realized the importance of this new movement. Abbot Wilhelm (1069–91) of Hirsau entrusted his monastery’s hospice to a group of brothers who were organized according to the new Augustinian rule. These brothers remained independent of the Benedictine monastery but were employed by its abbot to provide hospice services. These new communities insisted, as Eustathios and Basil had done, that authentic Christian ascetic life be rooted in service to others. In 1095 Pope Urban II demanded that warring knights and barons stop fighting each other and march eastward to liberate Jerusalem from the Muslims. Thousands heeded the call, and in 1099 a motley group of Western warriors without an acknowledged commander conquered the Holy City. When the Crusaders entered Jerusalem, they found a community of Augustinian brothers already there caring for Western pilgrims in a xenodocheion. Here visitors from Western lands such as England and France had been able to find a bed, food, and medical care if they fell ill. Under the Christian kings of Crusader-era Jerusalem, this hospital expanded rapidly—first, because many more pilgrims flocked to the Holy City now that it was in Christian hands, and second, because some of these visitors were great lords in Europe. When these powerful pilgrims returned home, they donated huge tracts of land to the Jerusalem hospital. The knights ride in During the twelfth century, the Jerusalem Hospital increasingly hired physicians and surgeons to give medical care to the sick, probably because so many pilgrims fell seriously ill in a new environment from bacteria and viruses against which they had no defenses. And the brothers of the hospital became a new order: The Knights of Saint John, or Hospitallers (see “Our lords the sick,” p. 31). The Knights not only expanded the healthcare services at their Jerusalem Hospital, they also built smaller hospitals throughout Europe. In the late twelfth century, one community of Augustinian brothers opened a hospital in Montpellier (South France), modeled on the Jerusalem Hospital. In 1204, the Montpellier brothers organized a hospital in Rome dedicated to the Holy Spirit. From here they spread throughout Western Europe, founding Holy Spirit hospitals in many towns. Although the rules of this new order did not mention physicians, the brothers from each community were to search their town for people incapacitated by disease and carry them to the hospital. The brothers were also to provide medicinal baths for patients. With time, hospitals devoted more and more resources to curing the sick. By the fifteenth century, Florence’s premier hospital, staffed by Augustinian sisters and brothers, hired the six leading physicians in the city to supervise patient care.